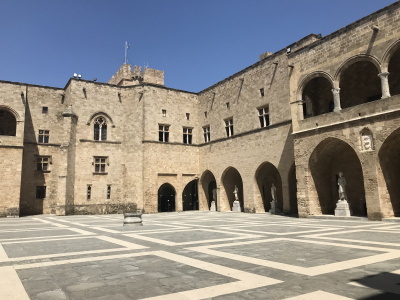 The Medieval City of Rhodes, built by the Christian military order Knights Hospitalers, is one of the best preserved medieval towns in Europe. The city center is located within a 4km long wall. It has numerous fine Frankish (Gothic) and Ottoman buildings. Rhodes would probably easy make it into the top 25 visited list on a community site for package tour travellers. The city is stuffed with visitors from cruise ships and the nearby party destinations, like Faliraki. No need to mention that almost every building within the walls is either a restaurant, a shop or a pension. Nevertheless Rhodes is one of the most beautiful medieval cities I've seen so far. The 4km town wall is stunning. The city is set at the sea and was occupied by the Ottomans for a few centuries, creating a really special flair. Further, Rhodes island is one of the sunniest places in Europe. Chances that clouds are ruining your pictures between April and October are pretty low. Definitely worth a trip. I visited Rhodes through an island tour stop. We spent the better part of the day here. We had a tour of the medieval city but then we explored on our own. the old city was incredible, one surprise after another as you wandered the alley ways. The area by the water was beautiful. I would suggest spending two-three days here; one went by way too fast. We also visited Lindos and I would recommend doing this. Lindos is older but holds a lot of history and is definitely worth the trip. I thouroughly suggest Rhodes as a holiday place , the medieval city is absolutely amazing and very well preserved, in between the two parts of the wall , there is an open theatre where live concerts of greek artists are given , nice music, the mystic yellow lights of the castle, a night summer breeze in the air, friendly people, and charter airplanes crossing the air with their lights every 10 minutes , make Rhodes one of Greeces most dynamic and classic places. The story of this order of St Johns knights is so interesting too, now i ll be looking for some books on this matter. I absolutely enjoyed my time in this magnificent town. One bad thing only, motor bikes should be forbiden of crossing the narrow streets of the old city..the noise is bothering. Thanks!! Near some expensive hotels there were a dozen bathing-beauties, some so poor they could only afford half of a bathing suit, so were barefoot from the waist up. Italian fascist architecture: Palace of the Grand Master. - An earlier building was destroyed by explosion in 1856 and stood in ruins until reconstructed by Italian architects under the instructions of Mussolini in 1937 as a holiday home for himself/royalty/aristocracy. Knights Hospitaller: Had been retrieved for Byzantium during the First Crusade. But, having been expelled from Jerusalem in 1291 the Knights Hospitaller occupied it in 1309 after a 2 year siege. They made it their HQ when they were fully expelled from Tripoli. Built in the 14th century: From 1309 on, the Knights Hospitaller rebuilt the city into a model of the European medieval ideal. 171 Community Members have visited.